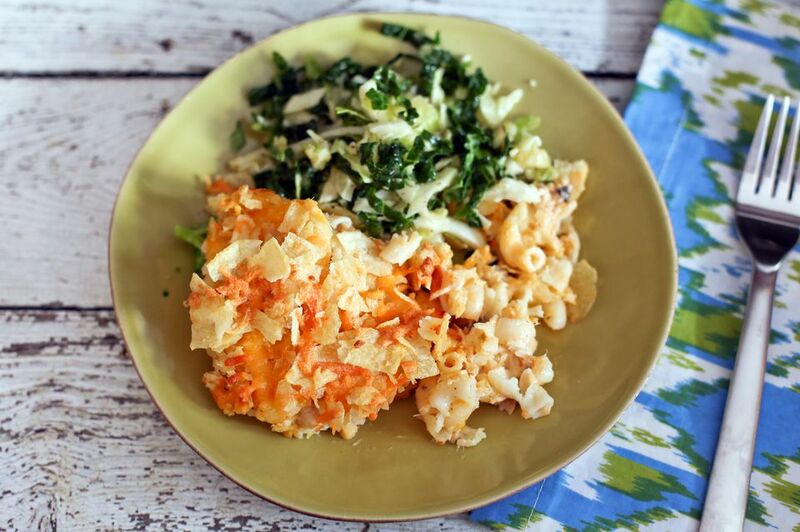 Tuna is added to this easy macaroni and cheese casserole, making it a satisfying main dish. Add some broccoli or a salad for a delicious everyday dinner. The casserole is baked with a crunchy potato chip and cheddar cheese topping. This would be excellent with some additions as well. Try it with diced pimientos, celery, or some sauteed chopped onions. Canned (drained) or sauteed fresh mushrooms would be good, too. If you aren't a fan of condensed soups, this simple white sauce can be doubled to replace the soup and milk in the recipe or see the instructions for a homemade mushroom sauce below. Butter a 2 1/2-quart baking dish. Cook macaroni in boiling salted water following package directions for al dente; drain and transfer to a large bowl. To the macaroni add the condensed cream of mushroom soup, milk, tuna, black pepper, seasoned salt, and 2 cups of the shredded cheese. Mix well and transfer to the prepared baking dish. Mix the crushed potato chips with the remaining cheese; sprinkle over macaroni mixture. Bake in the preheated oven for 35 to 45 minutes. In a medium saucepan over medium heat, saute 4 ounces of mushrooms in 4 tablespoons of butter. Add 4 tablespoons of flour and cook, stirring, until the flour is well incorporated into the butter mixture. Cook, stirring, for 2 minutes longer. Gradually stir in 2 cups of milk. Season with salt and freshly ground black pepper, along with an herb seasoning blend, if desired. Add it to the cooked and drained macaroni along with the tuna, pepper, salt, and 2 cups of shredded cheese. Continue with the topping and bake as directed. The sauce replaces the condensed soup and 3/4 cup of milk. Use part vegetable or chicken broth for a lighter sauce.